Q: Is there climbing in the Eastern Bighorns? A: To quote the late, great Todd Skinner, “there is more climbable rock in the Bighorns than anywhere else in Wyoming…”! The Eastern Bighorns are home to 22 developed crags with over 700 routes ranging from 5.3 through 5.14. In these (mostly) uncrowded gems, you’ll find a little bit of everything- overhanging dolomite pocket pulling, picturesque spires, multi-pitch trad routes, granite cracks, and boulders. Whatever your flavor, the Eastern Bighorns is sure to please your climbing palate. Q: 22 crags?! How will I know where to go? A: You’ll definitely want to get your hands on a copy of Rock Climbs of the Eastern Big Horns, 2nd Edition, by Trevor Bowman. The 2nd edition is available at local shops, including The Sports Lure in downtown Buffalo, the Sports Stop in Sheridan, and The Ten Sleep Rock Ranch in Ten Sleep in person and online. Q: What is the camping situation like in the Eastern Bighorns? A: The majority of the crags in the Bighorns are situated where dispersed camping or paid campgrounds are located nearby. This camping is usually either on Forest Service or state land, so please be sure to follow the rules and etiquette for each type of camping in those areas. The Bighorn Climbers’ Coalition works very closely with land managers to ensure that our user group are responsible stewards of the environment. If you have any questions about camping in specific areas, please refer to the guidebook and/or check out the websites for the Forest Service and state lands. Q: Camping isn’t really my thing…where else is there to stay? 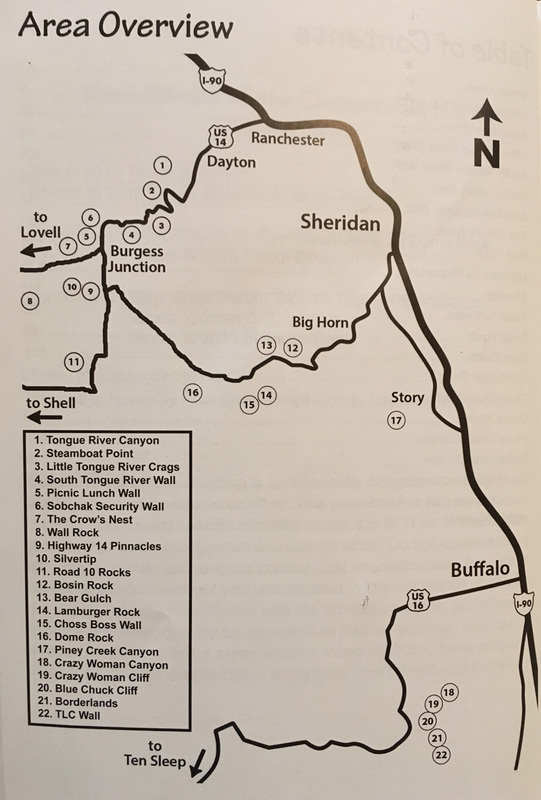 A: The communities of Buffalo and Sheridan are the two larger communities on the eastern side of the Bighorns. Both have your typical hotels and paid campgrounds/cabins. There is also lodging on Highway 14 near Burgess Junction and in the town of Dayton. Q: What is the best time of year to climb in the Eastern Bighorns? A: There are crags for almost every season in the Eastern Bighorns, including winter sport climbing at the Shipyard at Piney Creek or at the Winter Wall in Tongue River Canyon! Both of these locations receive a lot of sunlight throughout daylight hours in the winter months. Many climbers enjoy escaping the heat and crowds of Ten Sleep Canyon in the summer by heading to some of the higher elevation crags on the eastern side. You’ll want to refer to the guidebook for a full rundown of crags and sun/shade options, but in general, spring, summer, and gall climbing is possible. Q: Where can I get the most up-to-date spray for climbing in the Eastern Bighorns? A: Facebook users should head over to the Eastern Bighorns Climbing page to get connected with local route developers, climbers, and area enthusiasts. This page is managed by an eager group that is more than willing to spray you down with beta, offer a belay, or provide better insight to your questions. Please, don’t hesitate to ask!